Blame the dog. It's all his fault. He kept me from regularly updating this blog and providing links to my content in a timely fashion. Actually, like the proverbial dog that ate my homework, poor Dexter here had nothing at all to do with my lackadaisical web-keeping. Part of it has to do with ongoing changes at the Toronto Star in terms of its online content. Where once pretty much anything that saw print in the Wheels section would find its way onto the Wheels.ca website, several reworkings and some personnel and strategy changes made that hit and miss. Now, content can sometimes be found there, or sometimes at the "Autos" tab on the Star's home page, or sometimes neither. I'll try to stay on top of this. In the meantime, here's a back catalog of many of the articles that I have not yet linked to. Find my coverage of what interesting small cars to watch for - including Mazda's latest generation MX-5 - at the Toronto auto show here. Find my coverage of Cadillac's new from the Toronto auto show, which included the CTS-V, here. Find my coverage of Nissan's news from the Toronto auto show, which included the Nissan Titan XD, here. Find my review of Cadillac's very good ATS sedan here. 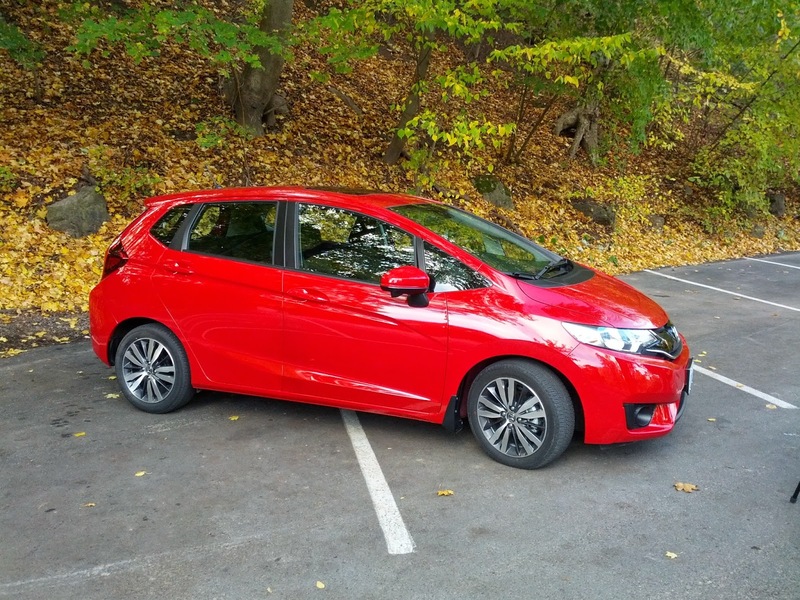 Find my coverage of the Best New Small Car (under $21k) in AJAC's 2015 Canadian Car of the Year, which was later won by the Honda Fit, here. Find my review of Buick's 2015 Enclave here. Find my story about the surprise that I had at work one day here. Sadly, though it looked like it would be a happy ending at the time the story was published, it ultimately did not end well. After coming down with some sort of respiratory infection, Chevy, as he became named by the shelter, was put on antibiotics, but did not respond to treatment. As his condition deteriorated, they had no real option but to put him down. 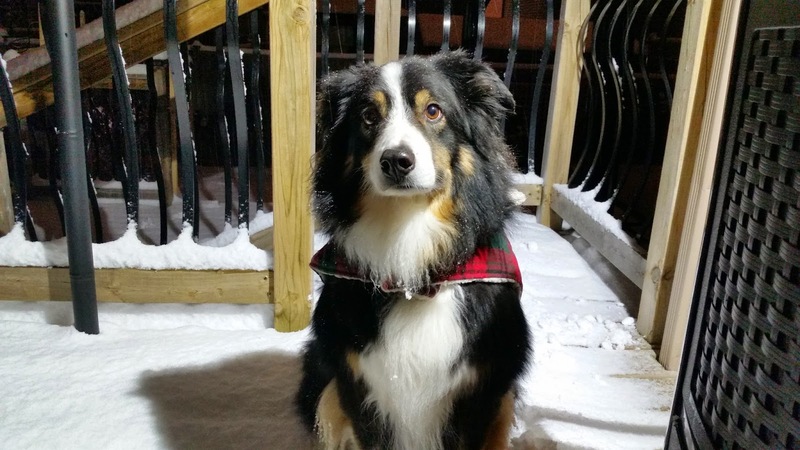 If there's an upside to this, the story did generate considerable foot traffic and awareness for the shelter, so it is doubtless that several of Chevy's peers found good homes as a result. 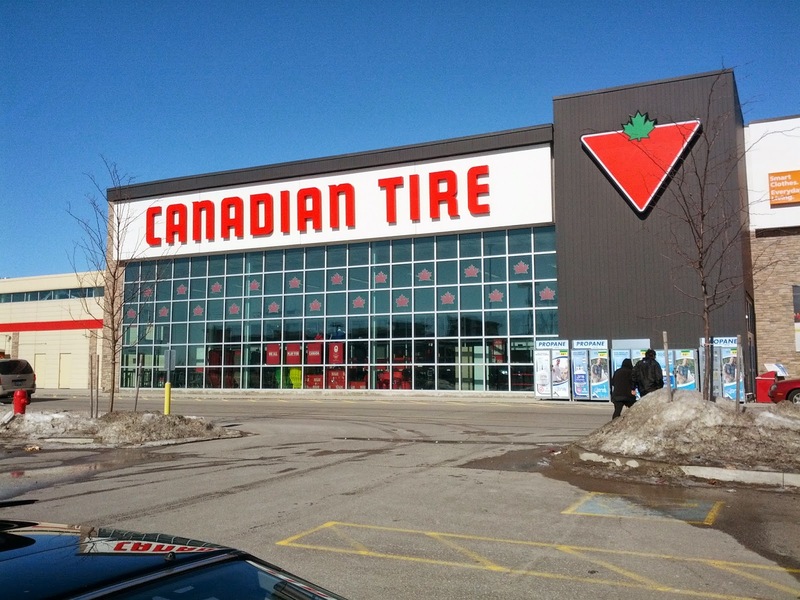 A Canadian Tire store - this is not the one where this adventure takes place. 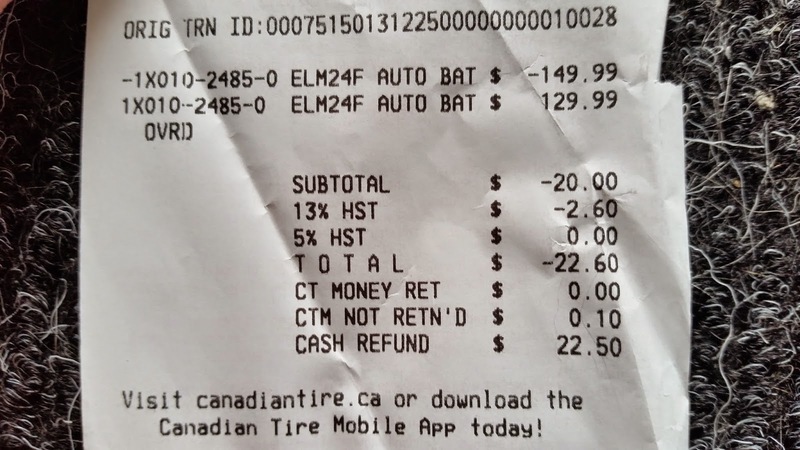 In my opinion, Canadian Tire is pulling a scam. 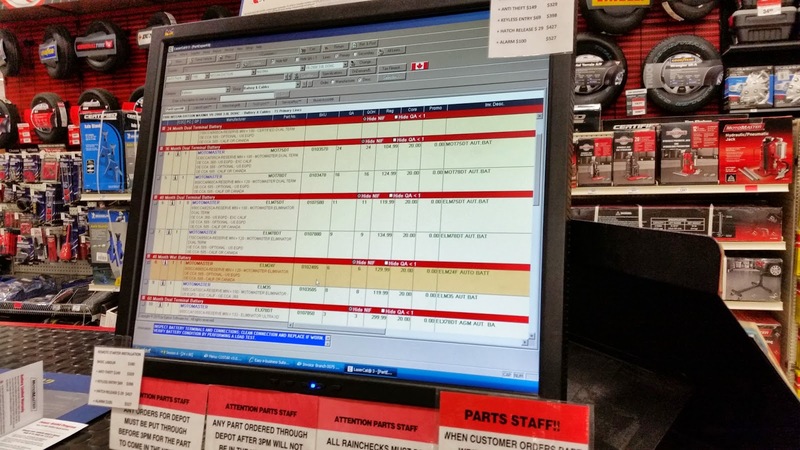 Always seems to happen on the weekend, right after my "first call" parts supplier is closed, that I end up needing some kind of auto part for one of my fleet. 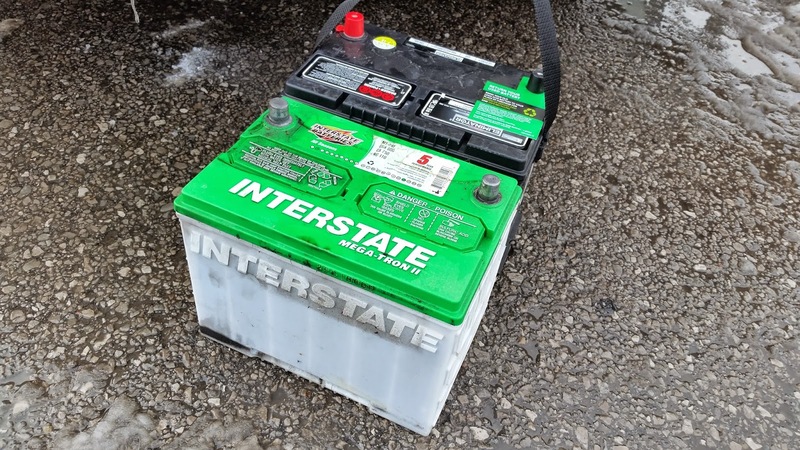 This time, the battery in my wife's car, a two and a half year-old Interstate "5 year" battery that ironically replaced the previous battery that died on a weekend. That's why I ended up with an Interstate (another one of my suppliers that was still open carries them). The only other Interstate battery I've ever bought died young too. This will be my last. Old and New - Note the core tag still on the new one's negative terminal. I figured that Canadian Tire would be likely to have both the best selection and the freshest stock, so I headed there. Their nationwide warranty doesn't hurt either. I also needed to buy a 10mm wrench and a battery terminal brush to do the swap, as my tools were at work and home, not with me, so one-stop shopping, right? It doesn't change the outcome, but I'm of the mindset that if you really don't know something, trying to sound like you do and being wrong is much worse, so say nothing. The original look-up result - a Group 75DT battery. The wrong right battery. He comes back with a dual-terminal Group 75 battery - a standard size for most pre-2005 GM vehicles. Would it fit? With enough screwing around, I could certainly make it function. That doesn't make it right. "This car takes a Group 24F battery", I inform him. "Oh," (fiddles with the computer) "you're right." Goes and gets it. It's slightly more expensive. I don't care. It's correct for the application. Ahh, that's better. The right right battery. Even if it is more expensive. A "core" is the old part being replaced. Core charges are like the deposit on your beer bottles that encourage you to return them. 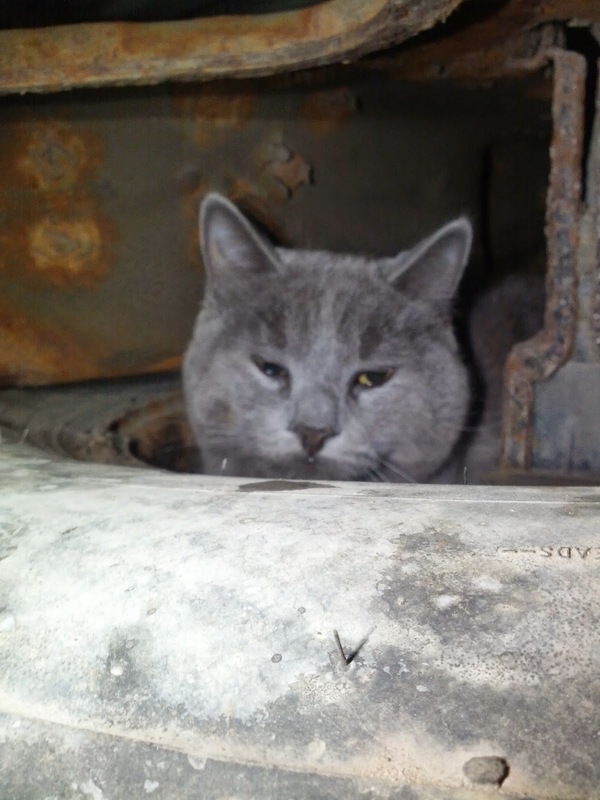 Automotive cores are either rebuilt (calipers, alternators, etc.) or reclaimed (batteries, among others). This is a long-standing practice that makes a lot of sense. In the case of the battery, it's $20, which is pretty closely aligned with what a scrap metal place will pay you for it. 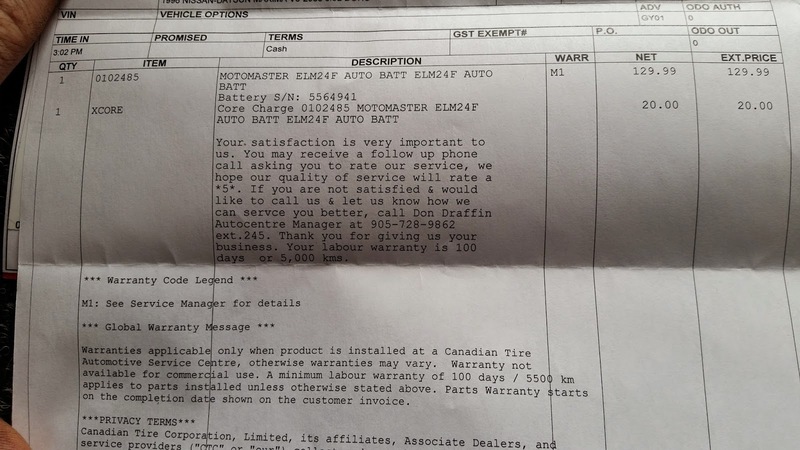 I have no problem with this, and as my wife's old battery was still out in her car waiting to be removed with the tools that I was buying alongside the battery, I had no qualms about paying it. Please note that the $20 was added onto the price of the battery. It shows as "XCore" in the item line. Swapped the battery in less than 5 minutes - easily, as it actually fit in the hold-down and plastic heat insulator because it's - gasp! - the right size - and went inside to return the old battery to get the core charge back. ...where we spent another 5-10 minutes waiting for the poor harried cashier and her supervisor to try and explain for the umpteenth time something battery return-related to the customer ahead of us. My patience had about exited the building by now. Finally, time to get our money back! We're handed back a $20 bill. Sounds fine, right? That's the scam! Remember, the $20 was added to the price of the battery. That total was taxed! We actually paid $22.60. It took several run-throughs before the two staffers grasped this concept. See the battery? "Motomaster ELM2" - $129.99, with the $20 core charge added in. "That's how the system does it, automatically! ", says the girl, explaining that the core charge return function only allows her to refund the $20. Listen, it's only $2.60, and the supervisor tried to give us the money out of his pocket when it became clear after several minutes that we weren't just going to leave. Canadian Tire has been selling batteries for over 75 years, and they don't just blindly hand extra tax dollars over to the government. You know, absolutely know, that at some point someone in Accounting discovered that the amount of tax collected didn't jibe with the amount of taxable merchandise sold. You can't tell me that they aren't aware of this discrepancy. 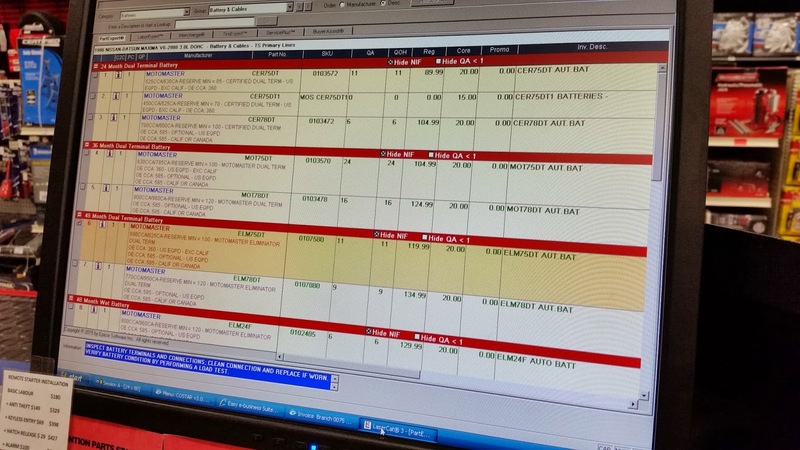 Their system will have provision for non-taxable items, which a core charge is. Instead, I believe that they rightly figure that most people won't clue in to this overcharge, and of those that do, very, very few will force the issue. In our case, after I threatened to go back out to the car to get the battery to return it, they readjusted the price and did a refund for the correct amount. This is how it got fixed - a work-around. 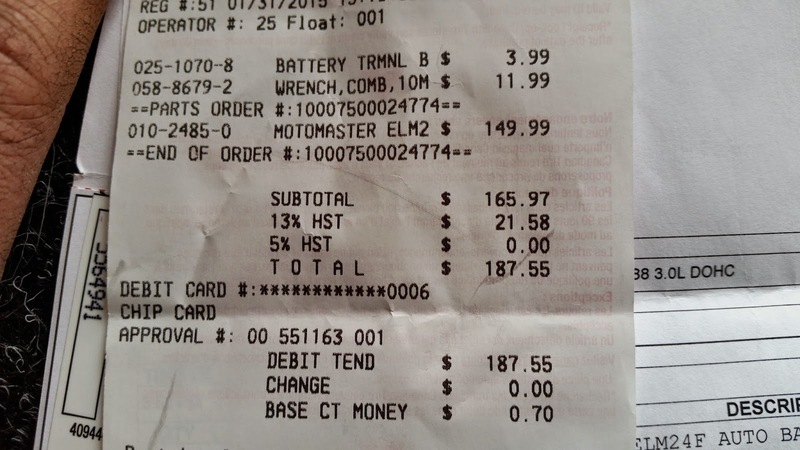 Given that Canadian Tire is likely the largest Canadian retailer of automotive batteries, and that they cater to the DIY'er crowd, many of whom will end up paying the core charge, if I'm right, it's a pretty big scam, gleaned $2.60 at a time. If I'm wrong, it's a system flaw that costs Canadian consumers tens of thousands of dollars or more a year. Either way, Canadian Tire is greatly deserving of a Jackass Award.